Got my new Arsenal .311" 170 gr. RD mold in this week for my 30-30, it will probably get used in a few other rifles as well but I mainly wanted it for my 30-30. The large meplat should make a nice hunting bullet and I had the mold cut 50-50 GC / PB as I usually leave the gas check off anyways on my 30-30 plinker loads. Looks like a good shape, especially for the .30-30. Looking forward to seeing the results. Question...What powder and amount do you use in .30-30 for lead bullets? I've been playing with Unique and feel that 10 grains is a bit anemic. Bushy, read the advice in Richard Lee's reloading manual and think about more grains of a slower powder. For mine 30/30's about 22,00 grains of H335 is a winner with 180-190 grs bullets. You should adjust the amount of powder on the weight and the hardness of the bullets. With lead bullets don't think about speed. Think about the young bull that says to the old bull: "See who can get the first cow?" And the old (heavy) bull answers: "Take it easy and let's take them all..."
PS: most of the time I don't use GC. My normal loading for my .30-30 is 32 grains of W-748, 170 grain Speer Hot-core FNSP. 2100 fps +/- 100 fps. I find that running at a little over 1500 fps tends to have a problem gettin' to the target at 100 yard. Missouri Bullet Co. .309 165 grain RNFP. Brinell 18, optimized. Well I mainly shoot two different loads. I like 7.0 grs. of Red Dot with 170 gr. 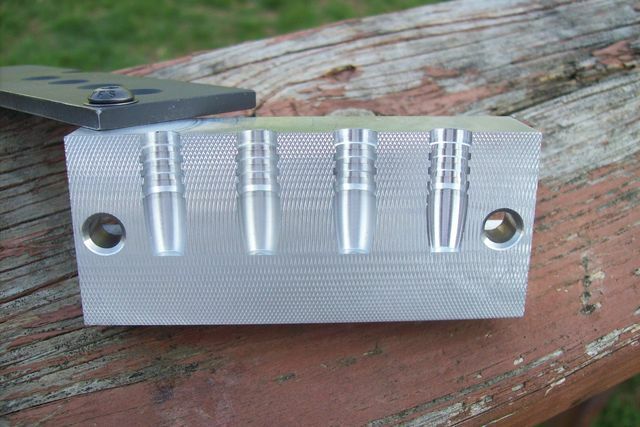 bullets with the gas check left off, of course with the new mold the plain base bullets will take care of that issue, I generally run AC WW's for plinker loads in the 1300 fps. range. For full powder loads I like 28 to 30 grs. of H-335. 30.0 grs. gets me around 2100+ fps. which is way more than I really need for most hunting applications around here, but I get excellent accuracy in the 1:12 twist 30-30 bore. When I get some bullets cast up and do some load test I will be working with H 4895 and Reloader #15 as well. 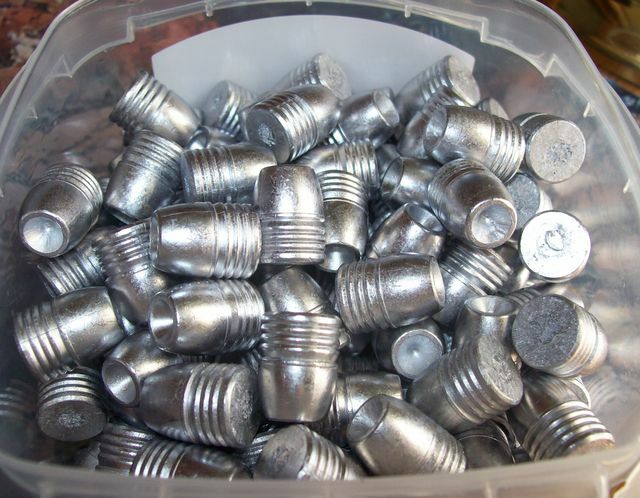 Cast up a little over 300 bullets yesterday, around 150 each of the plain base and gas check version of the bullet. 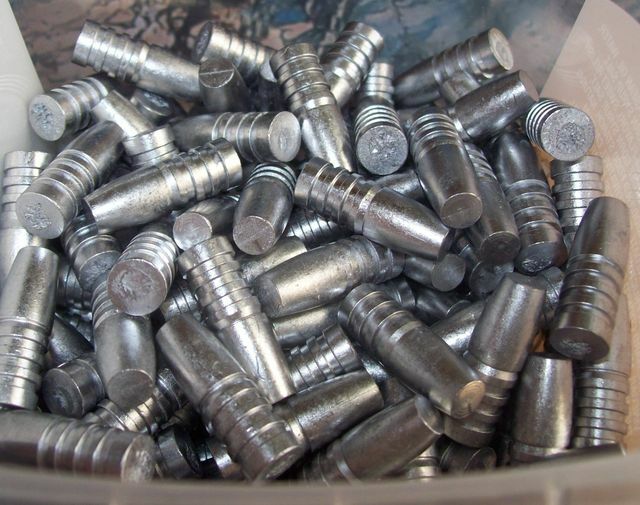 They drop .312" from the mold and will be sized to .311" I plan on powder coating the plain base bullets for my plinking and small game loads and gas checking and using traditional lube or PC for my full house loads in the 30-30. While I was at it I cast up a small batch of my NOE 220 gr. cup point bullet that I will be powder coating in clear gloss for loading in some nickel 45 ACP cases I recently acquired for long term storage. Look good mate, and those 30.30 boollitts look like they will really “do the job”. They were pretty much designed with the large meplat to do just that. The design has been changed a little but this mold is closest to the original, it just has standard grease grooves instead of the tumble lube grooves. 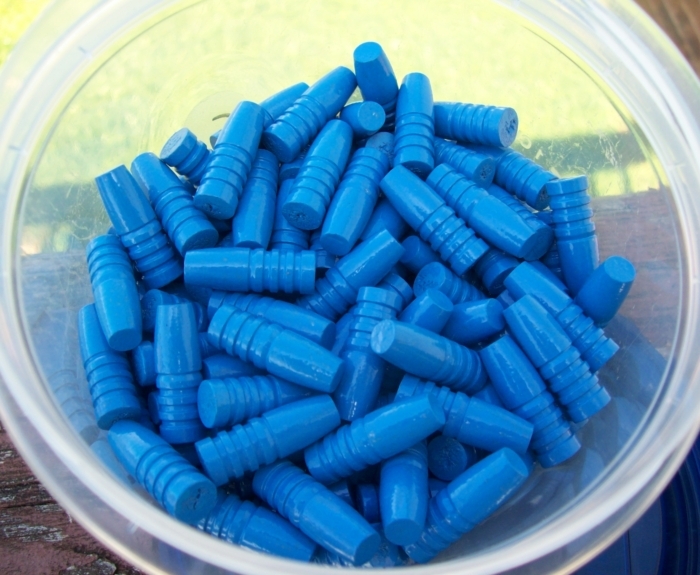 I did get the 150 plain base bullets powder coated up today using Smokes Carolina Blue.